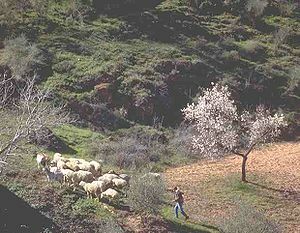 A shepherd looking after sheep in the mountains with olive trees. A shepherd is someone who looks after sheep. Shepherds usually take the sheep out into fields so that they can graze (eat the grass). In the same way, someone who looks after cows is called a “cowherd”. A "swineherd" looks after pigs and a "goatherd" looks after goats. A herd is a group of animals. "Herding" can also mean making a herd of animals go to another place. A female shepherd is called a “shepherdess”. Many years ago, when most people lived in the country, shepherding was very common. Sheep were kept for their milk, meat, and especially their wool. We know that there were shepherds in some parts of the world thousands of years ago. The shepherd’s job was to make sure the sheep were safe and they were not eaten by wolves or other wild animals. In many societies shepherds were an important part of the economy. Unlike farmers, shepherds were often wage earners. They were paid to watch other people’s sheep. Shepherds often lived all on their own. Some were nomads. Shepherds were most often the younger sons of simple farmers who did not inherit any land. Still in other societies, each family would have a family member to shepherd its flock, often a child or young person or an old person who was not able to help much with the harder work. Shepherds often worked with dogs. The dogs (sheepdogs) were trained to herd the sheep. Sheepdog trials are still popular today. The shepherd has to give signs to the dog to tell it exactly where he wants the sheep to go. A shepherd had a lot of time to sit and think or amuse himself. He often made simple instruments out of reeds that grew where he sat. These instruments were often simple pan flutes or just pipes which were similar to bamboo pipes or a modern recorder. Some shepherds learned to carve instruments out of wood. An example is the fujara from Slovakia and southern Poland. 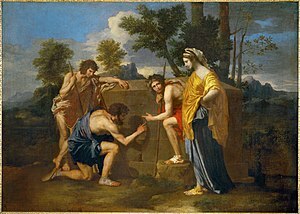 Les Bergers d’Arcadie (The Shepherds of Arcadia) by Nicolas Poussin. Shepherds often made up music. This is why composers of classical music very often wrote music which imitated the sound of the shepherd’s pipe. For example: in Mozart’s opera The Magic Flute the character Papageno, a birdcatcher, plays on his pipes. In the Symphonie Fantastique Berlioz wrote music which describes a shepherd playing his pipes, and a shepherdess far away the other side of the hill answering his call. Berlioz used an oboe and a cor anglais for this. Musicians were not the only people who liked the idea of the life of a shepherd. Many painters painted scenes in the country with sheep being looked after by a shepherd. Poets wrote about shepherds. The shepherd’s way of life was thought to be the ideal way to live. It was called Arcadian. Poems like these are called pastoral, after the term for herding. Some early examples are the Idylls of Theocritus, and the Eclogues of Virgil. King David was a shepherd before becoming King of Israel. In the Christian religion Jesus is often called “the good shepherd” because he looks after his people, as a shepherd looks after his sheep. Muhammad, the Prophet of Islam, was one of many prophets who worked as shepherds. This page was last changed on 3 September 2018, at 20:23.